I just.....don't even know what to say. About the fact that we've begun to read 'Little House in the Big Woods' by a truly glorious American, Laura Ingalls Wilder. I've really been of two minds about reading these books at all with my kiddo at this age (she's 7). I read them on my own, I think when I was in the 4th or 5th grade. I read most everything on my own; my parents didn't really read to me once I could read for myself. I'm not saying that in a poor me kind of way, that's just the way it was in my family. No one was big on the reading aloud thing, and I don't think I minded much. I just wanted to be left alone to read. I remember watching one of the "big girls" in my neighborhood (I'm guessing she was 9 or so) reading a 'Little House' book on the school bus one day. I was so impressed. Oh and this girl's name was Julia! I thought she was so grownup, and beautiful, and LUCKY, to be old enough to read these books that I had heard were so fantastic. I was in kindergarten or 1st grade at the time. These books were my obsession to the point where, midway through the series, I lied to my parents and told them that I was having double vision. I had it in my head that if I claimed such a thing, they would take me to the eye doctor, and the doctor might magically discover that I was losing my sight, just like Mary did in the books. Why I wished for such a thing to happen is really beyond my comprehension, but at the time I thought it sounded like a dramatic and romantic thing. My parents did indeed trundle me off to have my eyes examined. I was very disappointed when the doctor told us that my eyes were just fine. Better than fine! I had airline pilot vision. 20/13. And the fact that the names of the two actresses playing Laura and Mary on the TV show were Melissa Gilbert and Melissa Sue Anderson...TWO Melissas! It had to mean something! We were intertwined, connected. Oh that little coincidental factoid only served to flame my Little House fervor to an even higher level of absurdity. I think I was a prairie girl for Halloween two or three years in a row. Did anyone catch that PBS show, Frontier House, it was on several years ago, about modern day families trying to live on a prairie and build a log cabin and prepare themselves for winter? That show was FANTASTIC. Not one of the families were able to fully stock their food reserves to the extent necessary, if they, you know, actually wanted to survive an entire winter. It's funny that I'm so into all of this prairie biz, considering that I'm the person who is afraid to go camping in a tent and only wants to go if it's called "glamping" and a cute trailer is involved. But anyway, my family now IS a reading aloud type of family, and basically there was no way that we weren't going to start down the Little House road together. Later, perhaps Julia will want to read some of the other books on her own. I have to thank my college roommate for getting Julia the glorious hat you see in the photos. My friend was/is similarly obsessed. She came to visit a couple of years ago, and had just been in Oregon, and she produced this BONNET from her bag, and gifted it to my daughter. And Julia has been wearing it ever since, I kid you not. Every few months or so, out comes the bonnet. My darling friend also gave Julia these versions of the 'Little House' books. I've had 'Little House in the Big Woods' sitting in the pile of books by my kiddo's bed for a few months now, but other stuff kept jostling it to the back of the queue. 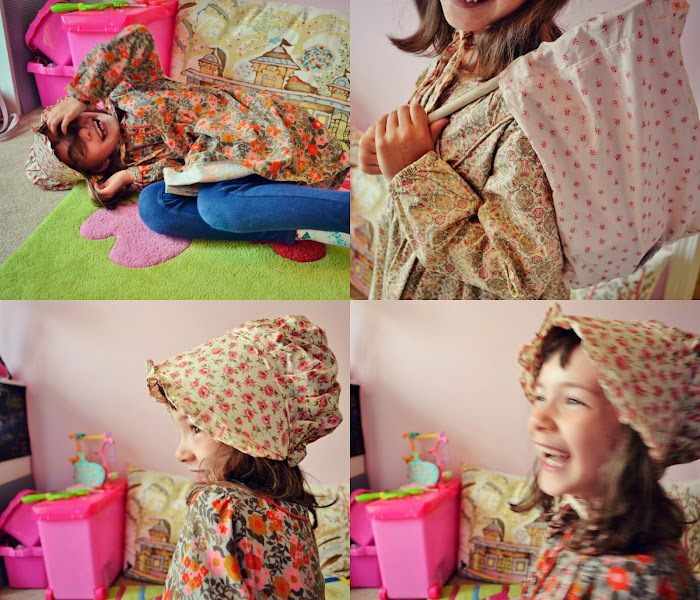 And then out of the blue, Julia grabbed her bonnet, and asked to dress up like a prairie girl (yes I somehow have managed to end up with not one but two, prairie-esque type frocks for my daughter) and play prairie school. And then she asked if we could read the book. So we began. Julia was alternately fascinated and horrified at the lengthy description of Butchering Day, which is when Laura's family slaughters their hog and puts it in the smokehouse, thus readying themselves for the impending cold winter. I'm wondering how we got started on this in the summer, but that's no nevermind, I guess. It must seem amazing to today's tech obsessed kids to read about children playing with corncob dollies. And to read about children who get the majority of their sweets only on Christmas. I remember every one of these books like the back of my hand. My personal favorites are 'On the Banks of Plum Creek' and 'Farmer Boy' (don't read that book if you're hungry!). I've said this before and I'll just keep on saying it over and over....reading books with my daughter, the ones that meant so much to me as a little girl....this experience goes right to the tippy top of parenting plusses. For me it comes right after hearing her say "I love you Mama" and seeing her face coming in every day to say good morning. Oh and we had a GRAND time playing Prairie School. My kiddo's name was "Rosemary" and I was "Miss Wingsproggle". 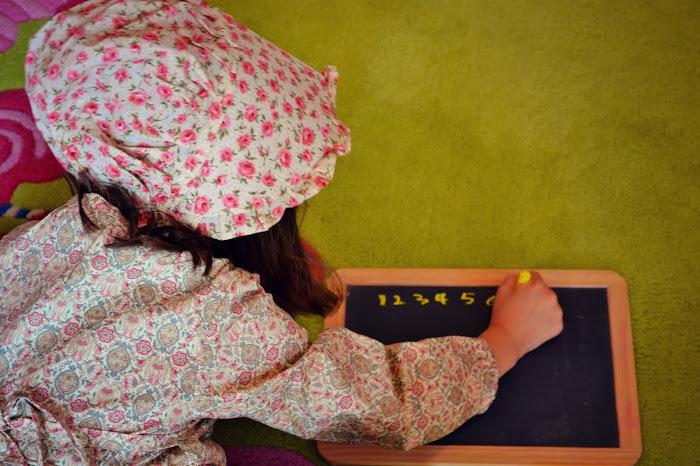 She wrote on her chalkboard slate (we've had one for a few years), did some math problems, ate sandwiches, and then harvested lettuce from the garden. I've been trying to get her to do a little bit of math work that all the kids came home with when school let out for the summer. She's been dodging me on it, and I've been letting her. But in prairie school? She was all for it. Clearly we're going to have keep playing prairie school. I am conflicted towards these books right now. On the one hand I loved them when I was a kid. But for some reason I never feel like reading them aloud. I did start reading Farmer Boy a few weeks ago, but the boys weren't really into it, so we switched books after a few chapters. I might try again, though. I tried reading Farmer Boy to my son and he didn't like it either and even I found it to be boring. Personally, I think these books are best for ages 8-9 and up. I couldn't resist reading the first one with my kiddo, but I think we're going to wait on the other ones until she's older! Julia is simply adorable in her bonnet!!! I love the TV serie and the books! I read Laura Ingalls'biography later as well and I feel so much respect for the pioneers who went through this much hardship. I wished my boy was more into reading because there are life-long lessons to be learned by those stories. The love of the land, the fruits from hard work, the love and family unity are values that I remember loving from the books. I can't wait to read these with Baby Whimsy. She even has a copy already and she's only 18 months old. I LOVE the bonnet. What a sweet gift. My parents didn't read aloud either. They encouraged reading but aren't readers themselves. I loved that show!!!! I love shows like that. A neighbor loves these books so much he began reading them to his daughter when she was 3 or 4, hee hee.... he might be more obsessed than I am! Fun!! We're about to get to the Christmas chapter! Loved these books. I read them at about the same age. I remember one sunny day when I was in bed with the flu, my Mum got me one as a treat. And I sat in bed by the open window, watching her sunbathe and reading it. (A really big open window, the type that would definitely have a kid proof lock on it now! Oh well, I did'nt fall out.) When I read them to my boys a few years ago I loved how she gave step by step details when they built their houses - like when they built the one in the river bank (I think by Plum Creek?) and when they tap the maple trees. Thanks for reminding me! I never read any of the Little House books, but we just got some for Freya and she seems to like them so far. Maybe we'll try reading one out loud. Thanks so much for the PBS show link, i can't wait to watch!! I think I need to watch that show again, Darcy!! Freya is a beautiful name by the way. Love it! We haven't read Farmer Boy, but we did read Big Woods through On the Banks of Plum Creek. The other books can wait until the girls are a bit older. We had such a good time doing our Laura thing last year! I love hearing about others reading through them, too. The most recent audio books are awesome, too, for anyone interested in that sort of thing. We listened to Little House on the Prairie last years on our way to Indepedence, KS and Laura's house in Missouri. Cherry Jones was the narrator, and she's amazing. This is so darn sweet, and you know I feel the same. I was given a tattered copy of Little House on the Prairie in the 5th grade and then yep, an obsession began! 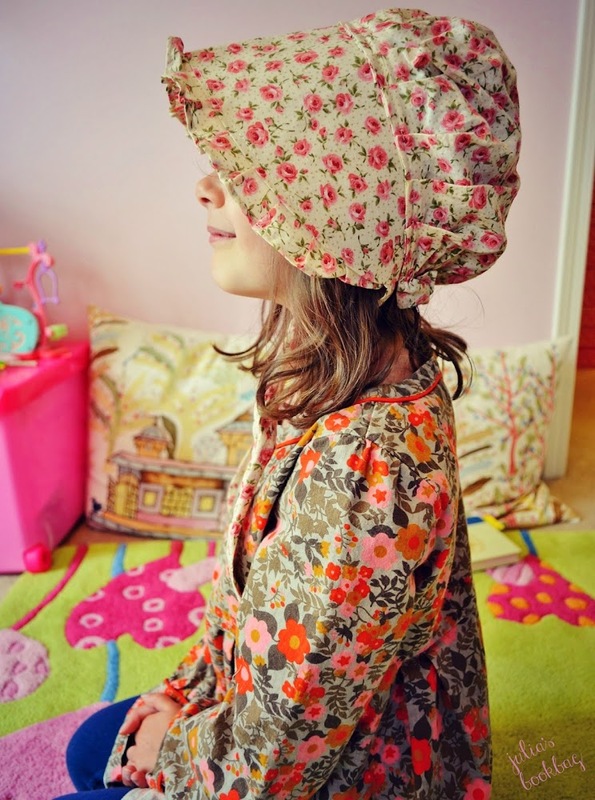 Julia looks so sweet in her bonnet, perfect for heading off to prairie school. and yeah...the beginning of that book is pretty gorey, isnt it? lol, I cant believe that's how she started it off but hey, those were (very!) different days back then! You know what I want to do? watch the TV show from the very beginning! I think I only began watching after the first or second season. I started reading Little House in the Big Woods aloud to my kids last summer while we were on vacation, though we got distracted and never finished. They both loved the butchering chapter, and my son loved the detailed description of how to clean a shotgun. We'll have to get back to it! I read it for the first time when I was in K or 1st grade--it was my very first chapter book! I remember devouring it in the backseat on a very long road trip. There IS a cookbook! And I saw it in a used book store and thought, oh another time. I really would love to have it! The First Four Years is a like a completely different Little House book, it's definitely written with an adult perspective. The part where some folks try and buy baby Rose?? !!!!!!! Darling Linda! Thank you! So, so much. OMG I think you were talking about ME (on the bus!)!!!! Obsessed does not begin to describe my love for these books. I got Big Woods and LHOTP when I was 7 or 8 as a gift. I read them over and over and was so excited to learn there were MORE! and I've made the heart cakes a few times. Amazing how very little sugar there is. Then I had mom sew me a bonnet. I think I begged. I still have it! And now to prove my bona fides in my love for all things Little House, in 1998 I went on a road trip from Minnesota to South Dakota and took Highway 14, aka the Laura Ingalls Wilder Historic Highway. I was 31 and single. Some nice woman asked if I was a teacher. I think she wondered what the hell a woman like me was doing out there! Most astonishing thing was how SMALL the surveyor's house really is. Oh I CAN NOT wait to read these to Harper! (then later Harry Potter.) I actually still read them to this day. When I'm in between books, depending on my mood, I might pull down Farmer Boy (oh the food! And all that work!) or Little Town for all the fun and school and romance. It makes me so happy to know Julia likes it all so well too! Yes! I was talking about you!!! Your blonde hair was all lit up by the sun, while you were reading. That image burned itself into my little kindergarten brain, I'll have you know! I must get the cookbook. Just must. I re-read Farmer Boy all the time! And the one where Laura and Almanzo start dating! I've read it like 100 times! My love for these books!!! OH!!! I tried Little House a bit too early with the boys and put it away for a while... we'll try again sometime. My mom read all of these books to me- several times each. And I remember listening to her read them to my little sister later on. I loved it, I loved it all!!! My big kids, 6 and 4 have really enjoyed those books (We'll pause a few years now that we have finished On The Shores of Silver Lake) - Laura really seems able to make all those descriptions interesting to young kids. Whenever we read one of them, my kids are pleased at how few chores they have to do compared to Mary and Laura. I can't help mentioning that the actual "Little House in the Woods" still stands in Pepin, Wisconsin, and is a well-maintained and free highway wayside (but the big woods is gone). As you read the book, you really miss how SMALL the place was. I saw a log cabin house recently...and it was the size of my family room...and apparently at one point there was a family of 9 living in it! I think there was an attic attached but still! I wanted to marry Almanzo with all of my heart, and then when I realized that wasn't going to happen I wanted to name my son Almanzo, or Wilder. Both did not happen. Maybe we will get a dog. Love! 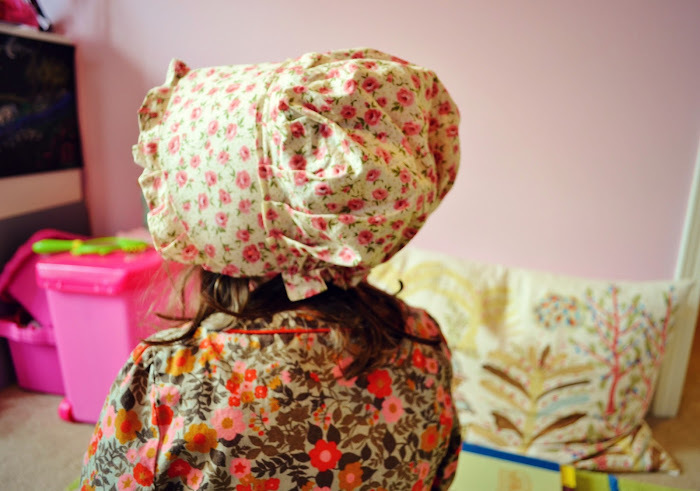 Thank God my child is not the only one who runs around the house and yard in a bonnet and prairie garb all day long! Ben often wonders if she should be doing it, but I say, let the imagination run wild and free while it can, right? Loved these books as a kid and loved the show and everything about it. I was reluctant to read them with juliet too because I didn't want to steal the opportunity of her reading them on her own, but we did read little house in the big woods this year and she loved it. I also think that she might forget all the little details and want to reread them on her own when she is older--so I think it is perfect! Glad you both are enjoying them and having so much fun! I looooved these books when I was a girl and have spent the last six months or do debating with myself as to whether or not Miss C. Is old enough to enjoy listening to them. J. looks so sweet in her bonnet. I'm sure I would have loved to have one when I was a girl. I was pretty obsessed with the idea of living an old fashioned life and there's a part of me that still yearns for it. Crazy, I know! You would have the sewing part of that life down pat Michelle!! Did you know there is a little House cookbook? There is, and it even has a recipe for Ma's vanity cakes from Plum Creek (those fascinated me as a kid for some reason). THANK YOU for letting me know about the prequels!!!!! I didn't know! I will look for them! I will find them! I did vaguely have a notion about the Rose books, but had completely forgotten. Oh I WILL be Little House-ing for a long time! Happy Day! !